Good Afternoon! 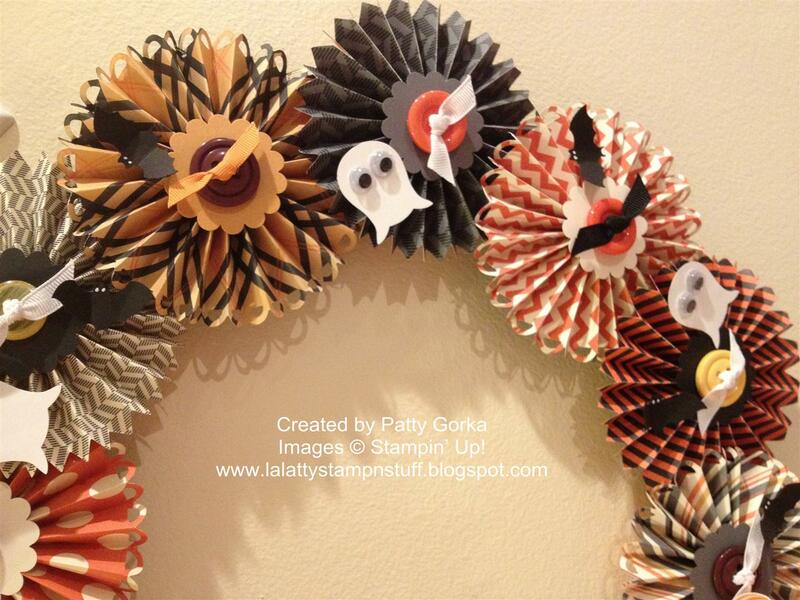 I recently made 2 of these wreaths and I though they turned out so cute for Halloween. I made this wreath and I ended up making a second one except the second wreath I left off the ghost and bats. 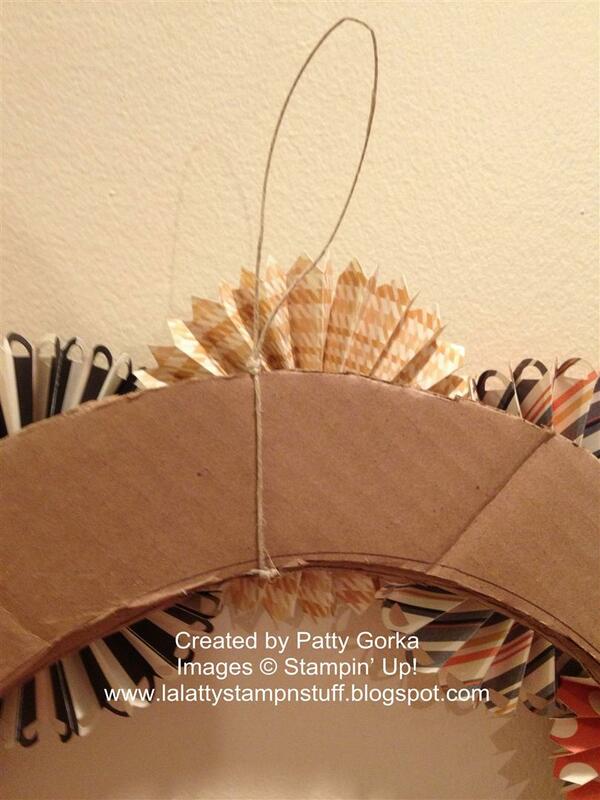 I posted a tutorial on my blog awhile back on how I made these wreaths. If you would like to see it you will find it here. I made this wreath the same way as I made my last wreath except that I didn't layer the medallions because I wanted to try and get 2 complete wreaths from one pack of dsp and it worked out perfectly. I was able to complete 2 wreaths using the rosette die and one full pack of the Howlstooth & Scaringbone Designer Series Paper (from the holiday catalog). 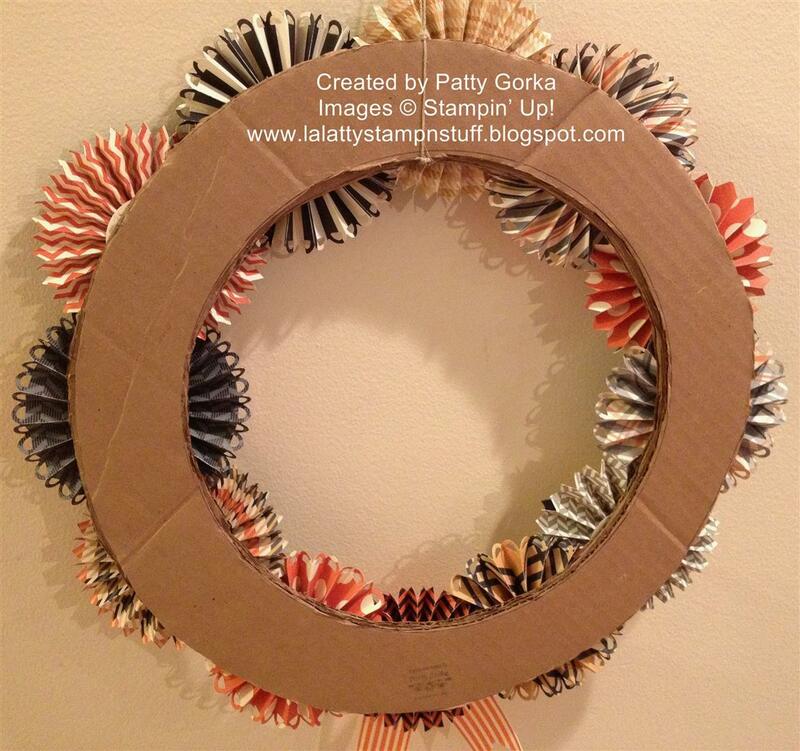 I have a few close up photos of my wreath shown below. The ghosts are upside down owls and the bats are punched out using the bat punch and I just added some eyes on the bats using my white gel pen. I tied some ribbon through the centers of the buttons. I purchased the buttons from the Stampin' Up! clearance rack awhile ago. Here is a photo of the back side of my wreath. I've had some questions in the past about what the back side of my wreaths looks like and this time I remembered to take a photo of it. I do use card board for my backing, but since one layer of card board isn't strong enough I cut out 2 layers and I glue them together, works like a charm. If you want you can get fancy and cover the card board with ribbon or something, but I don't because I want to make sure that my lollies/medallions are glued really well onto the cardboard wreath base. I tried something different with the hanging loop on my wreath and I think this worked out so much better. I took a piece of twine and I tied it off leaving a loop for hanging the wreath. Once I had my loop made I took the two ends below my knot and threaded them through the cardboard (you can even get the twine behind the medallion if you wanted) and then I tied off the ends. Once my ends were tied off I was able to push up the ends up in-between the card board wreath frames and then I was sure to secure it using lots of glue. Have a great day! I'll be back tomorrow morning with my 52 Christmas Throwndown blog post. Patty, this is FABulous!! It's absolutely magical!! 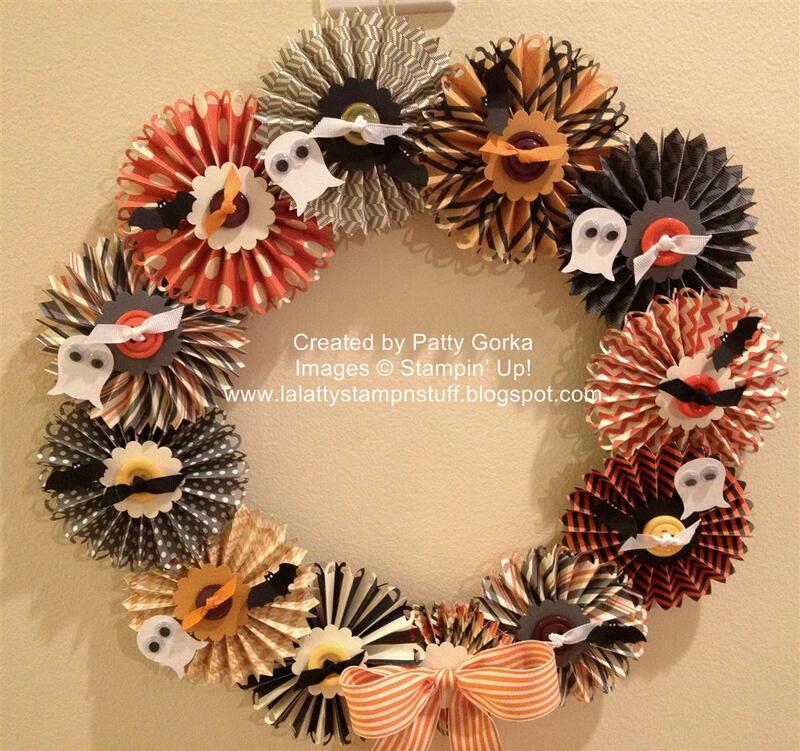 What a pretty wreath Patty - I love those cute little ghosts! WOW!!! What else can I say... WOW!!! I have yet to make a rosette...one of these days. Beautiful wreath! Kathi- I'm sorry I didn't think to add that information within my post. I just measured and the outside of my wreath base is a 13" circle. Let me know if you have any more questions. I SOOO want one of your wreaths!!!! I should try this one day, but it's alot of work!! Hi Patty, I have been following your blog for awhile now and just had to tell you how much I love all of the wreaths you have made! They are stunning! Thanks for sharing them with all of us and the great tips you shared along the way! Thanks again for your lovely comment, that was so sweet of you! I hope you see this message.